Energy Consumption and the Commute to Work VTC staff in association with Jeffrey Zupan, 4 pages. 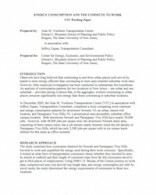 A working paper prepared for the Center for Energy, Economic and Environmental Policy at Rutgers University. January 2006.